That's the message from the Bank of International Settlements. In its latest report, the central bank watchdog said that with an improving economic outlook, policymakers should begin unwinding monetary easing and raising interest rates. Despite the upbeat assessment, the BIS warned that soaring debt levels and low productivity growth were persistent risks. Valentin Marinov, Managing Director and Head of G10 FX Research at Credit Agricole says he belives the Federal reserve will follow th eBIS advice to normalize quickly. He said this is to provide itself with firepower when the next downturn arrives. 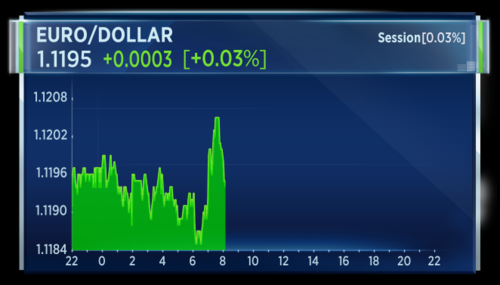 Meanwhile in the U.S. the Fed's John Williams has this morning said he sees gradual rate hikes as key to further U.S. growth. In Europe, Marinov said he expects QE tapering to begin in early 2018. Germany's Social Democratic Party has fallen further behind in polls ahead of the general election in September. German Chancellor Angela Merkel's Christian Democrats have opened up a 15-point lead a survey by the Emnid institute. But SPD leaders have remained defiant, urging members at a party conference over the weekend to continue the fight. 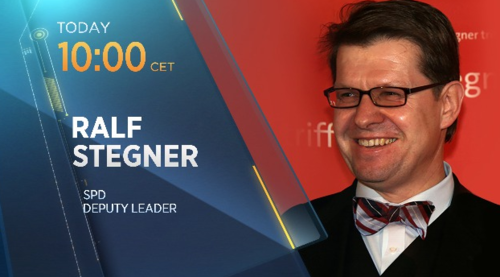 We'll sit down with SPD Deputy Leader Ralf Stegner today, shortly after 10 CET. He'll talk German elections and give us his take on the possible result of Brexit negotiations. The leader of the DUP in Northern Ireland, Arlene Foster, is to meet British Prime Minister Theresa May in Downing Street at 10:30 a.m. London time. Arlene Foster, leader of the Democratic Unionist Party (DUP), left. 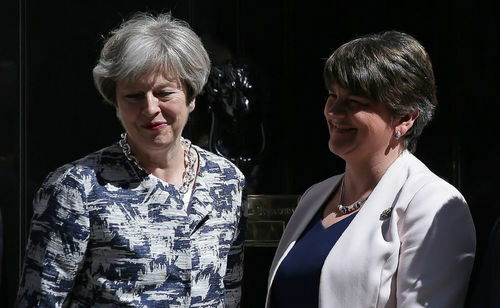 Speaking to Sky News, Arlene Foster said she was hoping to conclude two deals with the Prime Minister, one of which includes a deal on Northern Ireland power sharing. 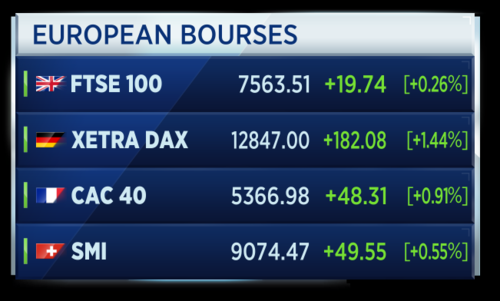 This is what we are seeing across the European markets so far today. In case you missed it, here is your open of trade. The German IFO index for business climate has come in at 115.1 in June. That bettering the forecast 114.4. The Expectations Index measured 106.8, which was above the expected 106.4. Current Conditions were 124.1 versus a forecast 123.3. 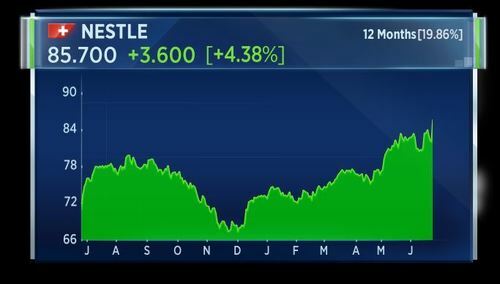 Nestle shares have jumped to the top of the Stoxx 600 after Hedge Fund Third Point revealed it now owns more than 1 percent of the Swiss food giant. Billionaire activist investor Dan Loeb has called on the world's largest packaged foods maker to shed non-core businesses, including a stake in cosmetics firm L'Oreal. On set, Gemma says Third Point wants Nestle to improve their profit target, divest its stake in L'Oreal and to optimize a so-called inefficient balance sheet. Gemma says activist hedge funds don't always get exactly what they want when attempting to steer big corporations, but usually some measures are taken on board which is in turn reflected in a higher share price. 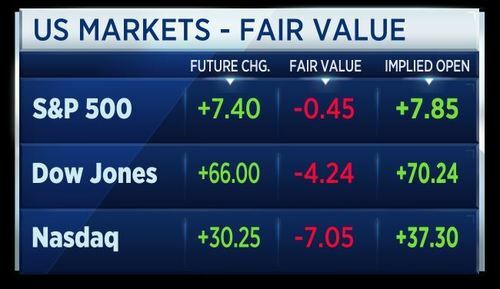 U.S. stock index futures pointed to a higher open on Monday, as investors watched the solid uptick in oil prices carefully, while looking ahead to key data releases. Kicking off the week, Monday is set to bring two batches of data during trade: durable goods and the Dallas Fed Manufacturing Survey, due out at 8.30 a.m. ET and 10.30 a.m. ET respectively. Meanwhile, three bond auctions are set to take place. 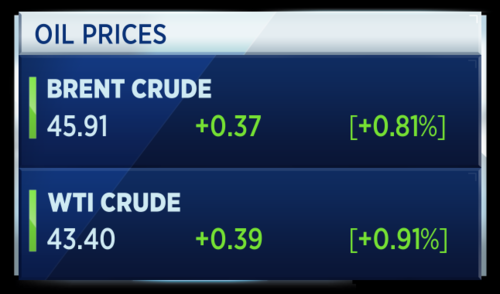 In the commodities space, oil have prices posted strong gains on the back of a weaker dollar. On Monday, crude futures were posting gains of just under 1 percent, with U.S. crude hovering around $43.40 at 04.45 a.m. ET, while Brent sat around $45.91. Gold has fallen through its 200-day moving average level of 1,240.1 on an intraday basis. The last time that happened was May 24th. 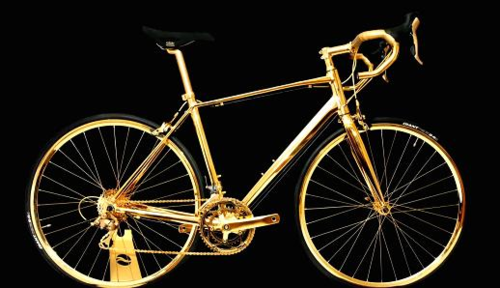 Gold is racing lower today. The European Central Bank will lend banks 12 billion euros at its weekly tender, more than the 11.52 billion euros maturing. The ECB will also allot 1.5 billion euros at its three-month long-term refinancing operation. That's more than the 1.31 billion euros maturing, a Reuters poll found on Monday. 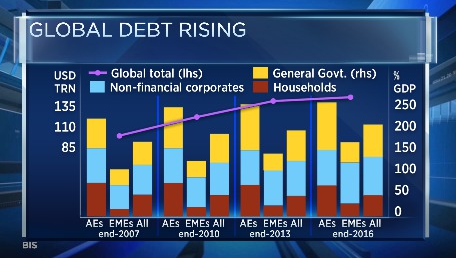 Meanwhile, the CEO of BBVA is backing calls for the ECB to get on with normalizing rates. 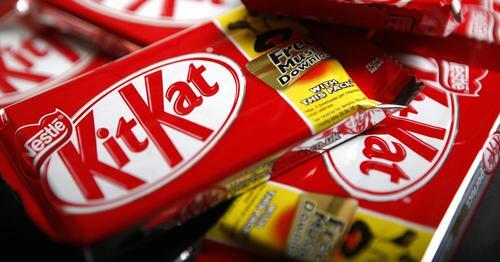 Nestle has issued a response to the news that the hedge fund Third Point has taken a stake in the company. A spokesman has said the following: "We remain committed to executing our strategy and creating long-term shareholder value." Two trouble Italian banks, Veneto Banca and Banca Popolare di Vicenza, are to be wound down, it was announced today. The bank Intesa Sanpaolo will absorb the good assets from the lenders, with the Italian government providing 4.8 billion euros to help Intesa keep its capital ratio. An additional 400 million euros will be set aside to cover any risk posed by the loans turning bad. The deal could cost the state up to 17 billion euros after the government said it will offer additional guarantees to cover potential losses. Commenting on the deal, a spokeswoman for German's finance minister says it is generally better to wind down unprofitable banks than to keep them alive artificially with recapitalisation. The spokeswoman added it is the European Commission's responsibility to minimise state aid to banks. 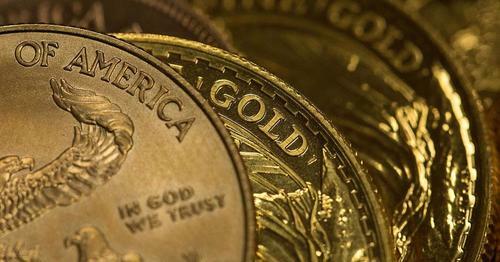 Gold is struggling today, hitting a six-week low due to a stronger dollar. Gold prices fell amid a stronger dollar and rise in Asian shares, ahead of a flurry of U.S. data due this week. The U.K.'s Conservative Party has reached a deal with Northern Ireland's Democratic Unionist Party. 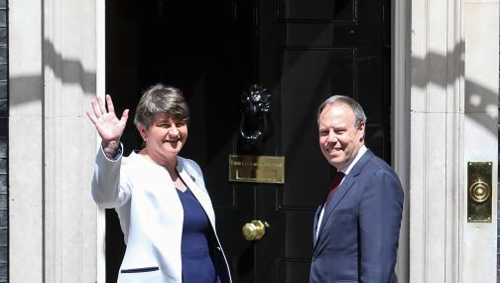 The DUP has agreed to support a minority Conservative government on a confidence and supply basis. The agreed deal will help prop up Prime Minister Theresa May's power. U.K. Prime Minister Theresa May has reached an agreement with Northern Ireland's DUP, which grants support for her minority government. The deal is based on a confidence and supply basis, which means the government will have the support of DUP politicians in votes of confidence in the government and votes on government spending. Theresa May with DUP leader Arlene Foster. Arlene Foster, leader of Northern Ireland's DUP, is speaking live. She says the deal to support the minority Conservative government includes maintaining the pension triple-lock, meeting the NATO requirement of 2 percent of GDP on defence and increasing spending in Ireland. 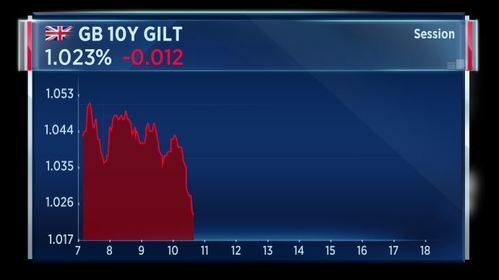 Yields on U.K. debt have fallen following announcements that the Conservatives and the DUP have signed a deal to support a minority government. The deal provides the government with some stability. Northern Ireland will receive more money as a result. 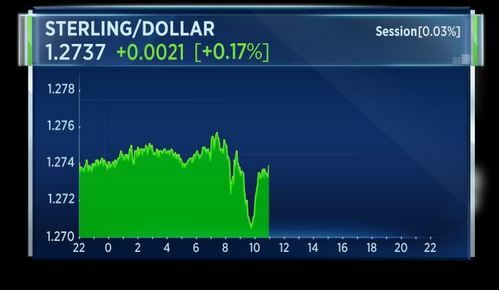 The deal has also secured the pension triple-lock for the whole of the U.K.
Sterling dipped sharply against the dollar before recovering as details of the agreement between the Conservatives and the DUP emerged. 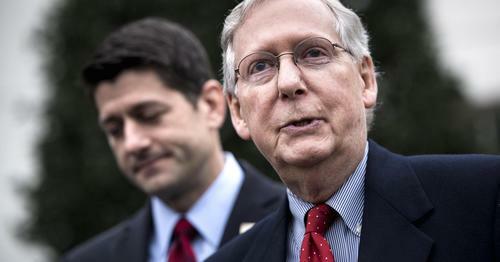 The Senate Republican's health-care reform bill doesn't add up. That's according to North Dakota's Democratic Senator Heidi Heitkamp. You have to look at it from a mile high and they're trying to tell you we're going to keep coverage the same, no one's going to get hurt, and we're going to take billions of dollars out of health care. Once it's parsed and people have a chance to look at it, it is only going to get more difficult. Nothing in the Senate Republican's health-care bill "adds up," Heitkamp tells CNBC. Germany's transport ministry expects the auto industry to should the cost of updating polluting diesel cars. That's according to Reuters citing government and industry sources. The ministry sees the cost of updating software in diesel cars being between 1.5 and 2.5 billion euros. Cars in need of the update include those with European emission standards of Euro-4, Euro-5 and Euro-6. 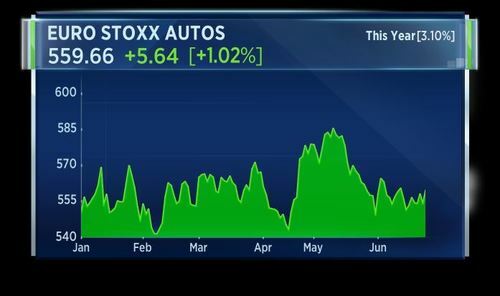 The autos sector of the Stoxx 600 is up more than 1 percent today and more than 3 percent year-to-date. U.S. May durable goods orders fell 1.1 percent. This is worse than the 0.6 percent expected and larger than April's fall of 0.9 percent. Durable orders excluding transportation was up 0.1 percent. Orders excluding defence was down 0.6 percent and general machinery orders were up 0.6 percent. Also, the Chicago Fed published its national activity index. This fell 0.26 points in May, versus a rise of 0.57 points in April. President Trump is on Twitter this morning to complain about the Democrats, calling them obstructionists. This comes as opposition to the Republican health care reform bill mounts. Five Republican senators so far have come out against the Senate GOP plan; the Republicans can only afford to lose two votes. 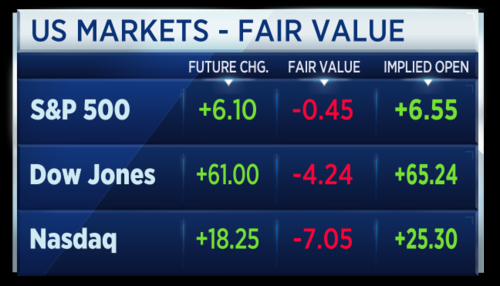 Less than 15 minutes to the open of U.S. markets and future values predict stock to jump higher at the start of the trading week. U.S. markets are now open and are rising higher. 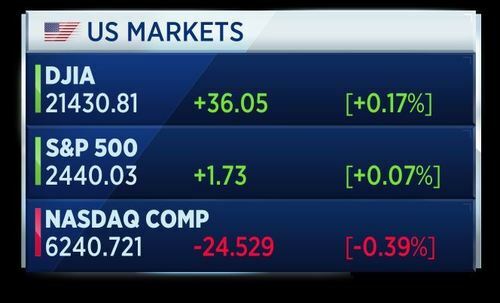 The Nasdaq is up for a fourth session, the Dow is up for the first time in five sessions and the S&P is gaining for a second day. 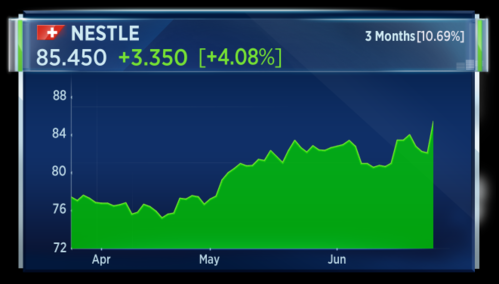 Nestle shares are at a record high today, following news that activist investor Dan Loeb and his company Third Point have bought a 1.3 percent stake in the Swiss chocolate maker. Shares are up more than 4 percent. 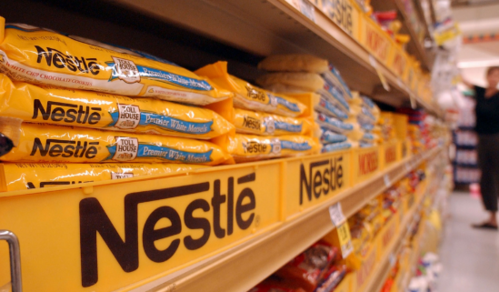 Nestlé is under pressure to boost profitability as the global food industry reacts to pressures from failed Kraft-Unilever deal, FT reports. Here's a last look at the U.S. markets before we close the blog. The Nasdaq's turned negative, after a three-day winning streak. 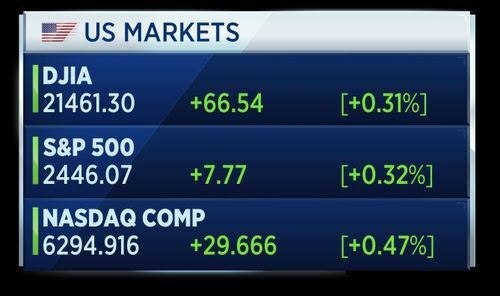 The Dow and S&P remain up. We'll close the blog there, thank you for reading. Join us again tomorrow, when we'll be reporting on the second day of the ECb Forum on Central Banking in Portugal. We'll also be covering the WEF’s Annual Meeting of the New Champions.